To print, or not to print? That is the question…and if you’re asking it, you’re probably stuck somewhere in the 1990s. Just kidding, but this kind of question should be rare in the days of the digital era. One of the trending methods to optimize workflow nowadays is to go paperless. If you still have those hefty piles of paper and bulky printers in your office, it is time to get of rid them. Don’t look for excuses to keep the printer; let the past and all its clutter go! The paperless office is a work environment where people totally eliminate or significantly reduce paper usage. Instead, people take advantage of their devices and use various file formats that can be easily shared using tools like email and online file sharing sites. The paperless concept first appeared in the 1990s around the time when PDFs were invented. However, for a few decades, it was more of an idea than a widely used methodology. It took time for people to change their work habits to begin to trade paper documents for digital files. In the last few years, the paperless movement has finally started gaining ground in the global workforce. It seems that businesses are ready to enjoy the advantages of a paperless office, and the wholly paperless future is just around the corner. Going digital means going green. First of all, reducing your paper usage prevents deforestation. In other words, you’re protecting our planet’s lungs. Secondly, you conserve not just the trees but also the water used to produce paper. Finally, you cut down on the air pollution produced by paper manufacturing and the fuel burned through its transportation. Every time you split or combine PDF files with FoxyUtils you help us give back to our environment. Learn more how we do this here. By saying ‘no’ to paper in the office, you kill two birds with one stone. You not only reduce your carbon footprint, but also save money. Instead of wasting capital on paper, printers, and ink, you can invest in the development of your company. To optimize the usage of your operating capital, look for ways to reduce or eliminate unnecessary expenses from paper and printers. Your employees already dedicate significant hours to processing paperwork. You don’t need them to spend any more time getting stuck just trying to set up the printer. Time wasted on organizing, administrating, and searching for paper documents could be spent more strategically. Going paperless is one of the most effective ways to boost your team’s productivity. By using digital document management systems, your team will have extra time to accomplish critical tasks, prevent delays, and increase you company’s revenue. Paper documents take up a lot of space. If you work in the financial or legal industries, the speed at which paper keeps piling up is particularly apparent. On the desk, on the floor, and on bookshelves, there is always paper clutter waiting to be organized. Digitalizing files can give you back that wasted space in your office. Documents can be easily stored on cloud service platforms or in an on-site server. Physical documents can be lost or damaged. It is also much harder to monitor the copying and printing of sensitive information. In the past, keeping documents secure was a trickier ordeal. Nowadays, you can take advantage of document management software to set up access rights and add digital signatures. It is a convenient and reliable way to prevent data leaks. Trying to implement the paperless concept without a plan is like trying to win a battle with no strategy. Take going paperless seriously and establish a complete program on how to convert your office into a paperless office. In a large company, certain people must be made responsible for the seamless implementation of the paperless system. They must set an example for team members and educate others on how to reduce and eventually eliminate printing. Unfortunately, not every country is digital-friendly (yet). Before trashing the last printer in your building, make sure to conduct research on the legal standards of your country. You may be required to keep some copies of documents with a wet ink signature. Make sure to double-check this information. Printing should be considered a bad habit. At first, it will be hard to re-educate your employees and make them give up excessive printing. 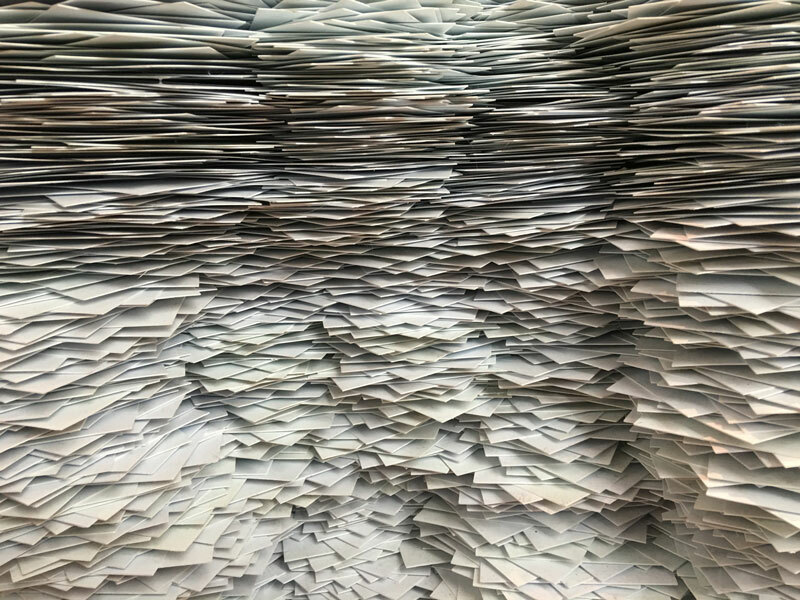 Going beyond putting people in charge of spearheading your company’s efforts to create a paperless office, you’ll have to take a few serious measures. First, remove most of the printers, leaving only a few for emergencies. Then, set a print limit for each employee. There are many types of print monitoring software to help you with this, such as PaperCut* or Xerox. Finally, the most essential step in creating a paperless office; gather all hard copies and scan them into the computer system. After you digitize your files, launch your PDF software which should be equipped with optical recognition capabilities (OCR) and convert the scanned files to searchable PDF documents. Voilà! – now you have the contents of all of those filing cabinets stored a click away in your computer. By the way, there’s no need to go searching for the best software for this vital step. FoxyUtils is here to help you convert your scanned documents into an editable format, so you can edit, merge, split, and compress your PDF files and keep them secure. Our platform has the OCR capabilities you need to make a paperless office your reality. Don’t keep documents on the shelves or on your desk; keep them in the Cloud. It makes the data accessible anytime, anywhere, and from any device and operating system. The current leader among file storage and synchronization services is Google Drive. It can store all of your documents, presentations and spreadsheets and allows for open access to other users so the whole team can edit and comment on one page simultaneously. It is a valuable tool for aiding your team’s collaborative efforts. A good alternative to Google Drive is Dropbox. Just as with Google drive, you can store and share files with your colleagues just in a few clicks. (By the way, premium users of FoxyUtils can directly connect to Dropbox or Google Drive and edit PDF files in the cloud). Try to update your accounting processes to shift to a paper-free work environment. It’s easier than ever to do with tools like Xero a user-friendly accounting platform for the simple management of invoicing, bookkeeping and bank reconciliation. Controlling cash inflows and outflows with accounting software can help you have a better overview of your finances and reduce the burn rate. One of the biggest obstacles for a paperless office is signing papers. However, you don’t need to print out documents to do this anymore, as you can sign them electronically and share them online. There are several comprehensive and secure platforms for e-signing your documents and contracts. Most of them are feature-rich and provide a suit of integrations with third-party tools. A few popular e-signature solutions are: PandaDoc, eSignLive, DocuSign, Hello Sign, Digisigner. We have more good news: FoxyUtils is about to launch its own e-signature feature, so very soon you’ll be able to not only edit and protect your documents, but also to electronically sign and share them with your team and clients. To boost efficiency and boost collaboration for your team, you can also switch to paperless notes and memos. The best app for taking digital notes is, without a doubt, Evernote. Evernote allows users to create and share notes and tasks with co-workers easily, quickly, and securely. Another advantage of Evernote is that it allows you to attach pictures, files, and voice and audio memos to notes. This tool also provides synchronization of notes and tasks across all devices and lets you access the notes even when you’re offline. Evernote is an eco-friendly alternative to traditional paper notebooks. Try it out and watch how the productivity of your team increases. To maintain your paperless system, you have to not only digitize your paper documents, but also choose a reliable and multifunctional PDF software program to convert and edit your files. You may choose to stick to offline desktop software or select a cloud-based PDF program that secures your files, allows you and your team to collaborate simultaneously, and gives you access from anywhere. One of these programs is FoxyUtils, which provides access to a number of basic and advanced features such as the ability to edit, merge, split, and compress your PDF files. Most importantly, FoxyUtils guarantees the security of your data with password protection for your documents and limited user access setup. If you are ready to reap the benefits of a paperless office, FoxyUtils is the digital and eco-friendly tool you need to make it a smooth transition. Why is Knowing How to Combine PDFs Essential?